The first sign of the German High Command's intention to engage in sabotage activities in the United States was disclosed by the apprehension of eight trained German saboteurs by Special Agents of the Federal Bureau of Investigation within two weeks after they had landed in the country from German submarines. These eight saboteurs had been thoroughly trained by the High Command of the German Army in the most modern methods of destruction and had been sent to this country for the specific purpose of interfering with the US war effort with particular emphasis being placed on interrupting production at aluminum and magnesium plants. One group of these saboteurs landed on the beach at Amagansett, Long Island, on the night of June 13, 1942. The second group of four men was landed on a beach a few miles below Jacksonville, Florida, on June 17, 1942. After their landings, these men dispersed to various parts of the United States but they were all in federal custody by June 27, 1942. The saboteurs were Ernest Peter Burger, age 36, George John Dasch, age 39, Herbert Hans Haupt, age 22, Edward John Kerling, age 34, Richard Quirin, age 34, Hermann Otto Neubauer, age 32, Werner Thiel, age 35, and Heinrich Harm Heinch, age 35. All of these men had been born in Germany and at one time or another had spent a portion of their lives in the United States, during which time they learned the English language and became acquainted with American customs. All of these men with the exception of Burger had returned to Germany since the outbreak of the present conflict. Burger had returned to Germany in 1933, after living in the United States for a period of six years. The German saboteurs who were sent to the United States were recruited for this work by one Lt. Walter Kappe who was attached to Abwehr 2 (Intelligence-2) of the German High Command and in charge of German sabotage in the United States. In addition to his connection with the German Army, Kappe was also an official in the Ausland Institute at Stuttgart, Germany; prior to the war, this organization was engaged in organizing Germans abroad into the Nazi Party and had the function of obtaining through Germans living in foreign countries various types of military, economic, political, and similar information. Kappe had lived in the United States from 1925 to 1937, during which time he took part in the organizing of the first Nazi organization in this country at Chicago known as Teutonia. He later was one of the principal organizers and an officer in the Friends of New Germany, which subsequently became the German-American Bund. In the latter organization, Kappe was press agent and in charge of propaganda and was editor of official Bund paper in the United States. Fritz Kuhn ousted him from the German-American Bund as a result of some inner-circle rivalries, after which time Kappe returned to Germany where he was placed in charge of the American section of the Ausland Institute at Stuttgart, Germany. It is known that periodic meetings were held in Berlin and in other cities throughout Germany of those Germans who had formerly lived in the United States. These groups were known by the name Comradeship U.S.A. Walter Kappe was one of the officials in charge of these meetings, which, it is believed, were held for the purpose of keeping up the morale of these Germans because they were accustomed to a higher standard of living in the United States than that which they had in Germany at that time. Kappe recruited several of the saboteurs from these groups. The Ausland organization also maintained a list of all Germans who returned to that country from the United States and was advised on all current arrivals. As a result of this information, Kappe was also able to keep in touch with all returning Germans and consider them for sabotage activities. Another source of recruits for sabotage missions to the United States is the Germany Army. In three instances, Kappe was able to arrange the transfer of Germans who had been in the United States from the German Army into the sabotage organization. No information has been received to indicate that any of the saboteurs were coerced in any way to engage in sabotage activities in this country. It is known, however, that the German High Command thoroughly investigated the background of the individuals proposed for sabotage training, and it is interesting note that the German Government placed a high value on an individual who had belonged to the German-American Bund or a similar organization while residing in the United States. It was stated that this indicated to the German Government the definite German sympathies of the individuals involved. The inducement to these recruits to engage in sabotage activities was the fact that they would be fulfilling their duty to their country. They also were promised good positions in Germany and other rewards upon their return to that country after their mission had been completed. Each saboteur signed a contract with the German Government whereby they were to receive to their credit certain sums each month. adoption of appropriate background, personal history, etc. After the completion of the training school, the saboteurs were taken on a three-day tour of aluminum and magnesium plants, railroad shops, canals and river locks, and other facilities for additional instructions as to the most vital spots to be sabotaged, as well as to learn the vulnerability of these facilities to various types of sabotage. Lt. Walter Kappe was in charge of this school. Two professors who were attached to the Technical Section of Abwehr 2, however, gave the technical training. The saboteurs were not permitted to make any permanent notes, which they could bring with them to the United States. All of their instructions had to be memorized. While at the school, maps of the United States were exhibited to them showing the important railroads and the places where sabotage would be most likely to cause a serious interruption in the transportation of raw material. They were also shown maps on which were located the principal aluminum and magnesium plants, as well as the locations of other important war industries. Similar maps outlining the important canals and waterways and the location of the important locks were also called to the attention of the saboteurs. 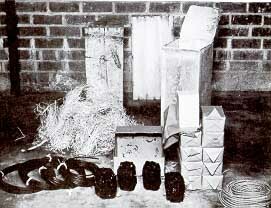 Each group of saboteurs brought with them to the United States four waterproof cases containing a large quantity of high explosives, bombs which were disguised to look like large pieces of coal, a considerable number and type of fuses, detonators and primers, as well as mechanical and chemical timing devices. One of the groups was also supplied with a considerable quantity of abrasive material for use in destroying railroad engines and other machinery. It was estimated that the explosives and other equipment furnished these men when utilized in connection with their training in preparing additional explosives and incendiary material would last the saboteurs two years. It is noted that no incendiary material of any kind was brought to the United States. It was expected that the saboteurs would be able to purchase in this country the necessary ingredients to prepare their own incendiary material. The saboteurs were supplied with large sums of money in American currency that was to be used by them for their expenses in carrying out their work of destruction. The Technical Section of Abwehr 2 placed most of this money in secret compartments of small bags and pieces of luggage. Smaller amounts were given to each saboteur in money belts. The leader of each group was furnished with the sum of $50,000 as a general fund. Each saboteur was given $4,000 in his money belt and in addition, approximately $400 in small bills for immediate use after his or her landing in the United States. The sum of $5,000 was also given to the group leader for each man in his group. This sum was to be turned over to the individual saboteurs as required. Practically all of this money was in $50 bills, none of which was counterfeit. At the time the saboteurs were apprehended by the FBI, $174,588.62 of their funds was seized. landed in Florida on June 17, 1942. In connection with the money furnished to the saboteurs, it is interesting to note that the German High Command made two errors. They included in the sum of money furnished to the individual saboteurs American gold notes that were no longer in circulation in the United States. They also were furnished some bills on which Japanese letters had been placed or other foreign markings, which would have aroused suspicion if they had been tendered in this country. In addition to the above equipment and money, the saboteurs wee also furnished with forged Selective Service cards and Social Security cards made out in the names of the aliases they expected to use. Those saboteurs who did not possess American made clothing were furnished clothing by the German High Command from a storehouse where the Germans had accumulated a large stock of clothing manufactured in various countries foreign to Germany. As previously stated, the saboteurs were brought to this country on two German submarines. These submarines departed during the early evening of May 26, and May 28, 1942, from a submarine base at Lorient, France. This method of travel was selected by the German High Command, who first considered sending these saboteurs to the United States in a sailing vessel. The saboteurs themselves had no choice as to their method of entry into this country, but the places of landing were selected in areas familiar to the leaders of the two groups. The landings by the saboteurs were made at night after the submarine had approached as close to the shore as possible. In one instance, one of the submarines actually touched bottom in approaching the shore. The landings were made from the submarines in small collapsible rubber boats. Sailors from the submarines accompanied the saboteurs to the shore and after the landing, returned to the submarines with the boats. The saboteurs who landed in Long Island were fully attired in German Marine uniforms. The uniforms were worn in order that these men would be considered prisoners of war and not as spies in the event their landing was discovered and they were prisoners. Immediately upon landing, they changed into the civilian clothes that they had brought with them and buried the uniforms on the beach with the other sabotage equipment they had brought with them. The men landing in Florida wore bathing suits and the only military equipment they wore was a German soldier's cap. The cap was worn for the same reason that the saboteurs in Long Island wore the entire uniform. There had been no previous arrangements made by the German High Command with anyone in the United States to assist in the landing of these saboteurs, and, in view of the magnitude of the undertaking and the extensive training and preparations for this sabotage mission, it is believed that the Germans would have had someone assisting these landings if they had any sabotage organization whatsoever in the United States at the time. The German saboteurs had been instructed by Lt. Walter Kappe, who appears to have been in complete charge in the recruitment, training, and preparation of this sabotage mission, not to commit any acts of sabotage until they had fully reestablished themselves in this country. They were advised, however, that there would be no objection if these men committed minor acts of sabotage such as placing explosives in locker boxes in department stores and railroads stations in order to affect the morale of the American people. In accordance with their instructions, immediately upon landing in the United States the saboteurs buried the boxes of explosives and other equipment that they brought to this country with them. Small trench-type shovels were brought with them from the submarine to assist them in burying their equipment in the sand. All of this equipment was recovered, either prior to or subsequent to their apprehension. A Coast Guardsman who was on patrol discovered the group of saboteurs who landed on the beach at Amagansett, Long Island, immediately after their landing. The Coast Guardsman at the time was unarmed, as were the saboteurs. The leader of the group of saboteurs attempted to bribe the Coast Guardsman to forget what he had seen and pressed upon him the sum of $260. After indicating that he would accept the bribe, the Coast Guardsman returned to his station and spread the alarm, realizing that something unusual had occurred as he had heard one of the saboteurs speak in a foreign language, which he could not understand. Members of the Coast Guard station returned to the beach where the saboteurs had landed, but they had disappeared. The submarine could still be heard off shore at the time the Coast Guardsmen returned to the beach. The saboteurs in the meantime had left the beach and proceeded to the nearby railroad station where they caught the first westbound train for New York City. One of the team members, George Dasch, telephoned the New York office of the FBI. Dasch told the FBI agent that he had important information for J. Edgar Hoover and that he, Dasch, was going to Washington to talk with Hoover. The next day Dasch took the train to Washington, spent the night at a local hotel, and the following morning walked into FBI Headquarters. Dasch provided the details of the saboteurs' training, their targets and turned over the substantial US currency provided by the German High Command to support their work in the United States. Based on Dasch's information, the FBI was able to arrest all the saboteurs in a few days. Special Agents of the Federal Bureau of Investigation arrested two of the saboteurs, Heinrich Harm Heinck and Richard Quirin, in New York on June 20, 1942. Ernest Peter Burger was arrested on the same day, and, on June 22, George John Dasch, the leader of the group was also arrested in New York City. The second group of saboteurs landed in Florida without anyone observing them. Shortly after landing, they changed into their civilian clothes and thereafter made their way to Jacksonville, Florida, where they remained for a short time, after which they dispersed to various parts of the United States. Two of the group, Herbert Hans Haupt and Hermann Otto Neubauer, proceeded to Cincinnati and then to Chicago. Edward John Kerling, the leader of this group together with Werner Thiel, proceeded to New York City from Jacksonville via Cincinnati. Kerling and Thiel were arrested on June 24, 1942, in New York. Haupt and Neubauer were apprehended on June 27, 1942, in Chicago. The importance of the aluminum and magnesium industries, the so-called "light-metal" industry, to our war effort was emphasized to the saboteurs, and these industries were the primary objectives of the two groups of saboteurs. The saboteurs had received special training with respect to the destruction of this type of plant. The saboteurs were informed that if the production of aluminum and magnesium could be interrupted, it would have a serious effect on the number of military aircraft produced by the United States, which would have a definite effect upon the outcome of the war. After the capture of both groups of saboteurs, the German Government made an effort via Swiss diplomatic channels to have the saboteurs treated as prisoners of war, which meant that they would be imprisoned until the end of the war, under the Hague Convention of 1907. The United States replied that the captured individuals were not soldiers but spies and could be executed without a trial. President Franklin D. Roosevelt ordered that the captured Nazis be tried by a secret military tribunal which would issue its findings without any appeal. Pursuant to an Executive Order of the President of the United States, the eight saboteurs were tried before a Military Commission composed of seven United States Army Officers appointed by the President. Trial was held in the Department of Justice Building, Washington, D.C. from July 8, 1942, until August 4, 1942. The saboteurs were prosecuted by the Honorable Francis Biddle, the Attorney General of the United States and by Maj. Gen. Myron C. Cramer, the Judge Advocate General of the War Department. During the trial, a petition of Habeas Corpus seeking trial by jury before a civilian court was denied. All the individuals sentenced to death in the electric chair were executed at noon the next day. The executed men were buried in unmarked graves on a government reservation in Washington, D.C. In 1948, President Truman commuted the prison terms of George John Dasch and Ernest Peter Burger. On April 26, 1948, George Dasch and Ernest Peter Burger were flown to the American sector of occupied Germany and turned over to American military representatives, who freed them him on parole to return to their native land. There is attached hereto a brief biographic sketch of the German saboteurs. George John Dasch was the leader of the group of German saboteurs who landed from a submarine at Amagansett, Long Island, on the morning of June 13, 1942. Dasch was subsequently apprehended by Special Agents of the Federal Bureau of Investigation, tried before a Military Commission in Washington, D.C., and upon his conviction was sentenced to thirty years' imprisonment. Dasch is a German citizen, having been born on February 7, 1903, in Speyer-on-the-Rhine in Germany. Dasch entered a convent to study for the priesthood when thirteen years of age and in 1917, at the age of fourteen, enlisted in the German Army, serving in Northern France for eleven months. Dasch illegally entered the United States on October 4, 1922, as a stowaway on an American ship. He returned to Germany in October 1923, in order to legally enter the United States, returning to the United States on the same vessel upon which he sailed to Hamburg. Between 1923 and 1941, Dasch returned to Germany on two short visits. Dasch enlisted as a private in the US Army and served slightly more than one year, at which time he purchased himself out of the Army and received an honorable discharge. On September 18, 1930, Dasch married Rose Marie Guille, a native American. While Dasch was in the United States he was engaged in various occupations but for the most part he worked as a waiter in various hotels and restaurants in the New York area. Dasch filed a declaration of intention to become a citizen but never applied for his final citizenship papers. On March 22, 1941, Dasch left New York City to return to Germany by way of Japan. The expenses of his trip were by paid by the German Consulate in New York City. He arrived in Berlin on May 13, 1941. He was eventually employed by the German Foreign Office as a monitor of foreign-language broadcasts. While serving in this capacity, Lt. Walter Kappe of Abwehr 2 recruited him, and he returned to the United States as a member of a group of German sabotage agents. Kappe first approached Dasch for this mission in November or December 1941. His employment with the radio listening stations was terminated on February 27, 1942. Dasch entered the sabotage school at Quentz Lake on April 10, 1942. The files of the Federal Bureau of Investigation fail to indicate any prior criminal record for George John Dasch. Ernest Peter Burger was a member of the group of German saboteurs who were landed by submarine near Amagansett, Long Island, on the early morning of June 13, 1942. Burger was subsequently taken into custody by Agents of the Federal Bureau of Investigation, tried before a military commission in Washington, D.C., and sentenced to life imprisonment after his conviction. Burger was born on September 1, 1906, at Augsburg, Bavaria, Germany. He received an elementary and technical education. Upon completing his technical training in 1926, he worked as a machinist for one year. Burger arrived in the United States on February 26, 1927, on an immigrant quota visa. While in this country Burger worked in various machine shops in Milwaukee, Wisconsin, and Detroit, Michigan, and became a naturalized citizen on February 14, 1933, at Milwaukee, Wisconsin. Burger left the United States on a visit to Germany on July 27, 1929, and returned to this country on October 27, 1929. Burger returned to Germany in the summer of 1933 where he remained until 1942, when he came to this country aboard a German submarine on a sabotage mission. Burger became a member of the National Socialist Party in Germany in 1923 at Augsburg. There was some indication that his first trip to the United States was as a result of his activities with this political party, which was not then in power in Germany. Upon returning to Germany in 1933, Burger was readmitted to the Party and because of his previous membership, obtained employment with the Party in the political division of the Reichsleitungen, in which position he engaged in propaganda and journalism for internal consumption. At the time of Hitler's blood purge within the Nazi Party, including the execution of Ernest Roehm, Burger was attached to Roehm's staff. Although Burger escaped the purge, the Gestapo arrested him in March 1940 for his criticism of certain Party politics and activities. He then spent seventeen months in a concentration camp. After Burger's release from the concentration camp, he was drafted into the German Army as a private. He then sought a different assignment and by reason of his friendship with certain old Nazi Party members, became acquainted with Lt. Walter Kappe of Abwehr 2 who subsequently recruited him for service as a saboteur in the United States. The files of the Federal Bureau of Investigation fail to indicate any prior criminal record for Ernest Peter Burger. Heinrich Harm Heinck was a member of the group of German saboteurs who were landed by submarine near Amagansett, Long Island, on the morning of June 13, 1942. Heinck was subsequently taken into custody by Agents of the Federal Bureau of Investigation, tried before a military commission in Washington, D.C., and upon his conviction was executed. Heinck was born on June 27, 1907, at Hamburg, Germany. Heinck was educated in the public schools in that city and served as machinist's apprentice in the machine shop of the Hamburg-American Lines. He then became employed as machinist's help and oiler on vessels of his employer and after making several trips to the United States, jumped ship at the Port of New York during the summer of 1926. Heinck resided in New York City from 1926 until March 1939, during which time he married his German-born wife. Heinck obtained employment in various machine shops in the New York area. During 1934 and 1935, he was a member of the German-American Bund and the O.D. (Ordungs Dienst). While a member of the Bund in New York, Heinck became acquainted with Walter Kappe, who at that time was editor of the German-American Bund news publication "Weckruf" and "Beobachter." Heinck eventually left the Bund when it was ordered that only American citizens could be members of the Bund. At that time, he joined the DAB (German-American Vocational League). Heinck returned to Germany in March 1939, after an official of the German Labor Front in New York had urged his return. Through this official, the German Consulate in New York arranged for Heinck's return to Germany at a reduced fare. Upon his arrival in Germany, Heinck obtained a position through the German Labor Front in a branch of the Volkswagenwerk plant in Braunschweig, which is owned by the German Labor Front. During this employment, Heinck met Richard Quirin, who was employed at this plant and who later returned to the United States with Heinck as a saboteur. During Heinck's employment at this plant, he attempted to join the German Army but was rejected due to his employment as an expert tool and die maker in an essential war industry. In January 1942, at a meeting of persons in Braunschweig who had formally lived in the United States, Heinck again met Walter Kappe, who was a speaker representing the Ausland Institute. At this meeting, Heinck and Kappe renewed their New York acquaintanceship. A short time thereafter, Heinck and Quirin were recruited by Kappe to return to the United States on a secret mission and after which, they received training at the sabotage school at Brandenberg. The files of the Federal Bureau of Investigation fail to indicate any prior criminal record for Heinrich Harm Heinck. Richard Quirin was a member of the group of German saboteurs who were landed by submarine on the morning of June 13, 1942, near Amagansett, Long Island. Quirin was subsequently taken into custody by Agents of the Federal Bureau of Investigation, tried before a military commission in Washington, D.C., and upon his conviction was executed. Quirin was born in Berlin, Germany, on April 26, 1908. He attended public schools in Germany and was thereafter employed as a machinist's help at Hanover, Germany, until 1927, when he immigrated to the United States arriving at the Port of New York on October 17, 1927. Quirin remained in the United States until 1939, during which time he married a German-born girl and obtained employment at various places as a machinist and during the depression worked at odd jobs. He joined the Friends of New Germany about 1933 and was a member of the O.D. (Ordungs Dienst) group. He resigned from this organization sometime in 1934 at the direction of the German Consulate. The German Consulate enrolled him at that time as a member of the NSDAP. In 1939, after learning that the German Government was paying the passage of any mechanics desiring to return to Germany, he contacted the German Consulate in New York City. The German Consulate paid his passage back to Germany, and Quirin departed from the United States in July 1939. Prior to leaving the United States, Quirin purchased Rueckwanderer marks with the money he had saved while he was in the United States. Upon his arrival in Germany, he was met by a representative of the German Labor Front who questioned him concerning his trade and where he desired to work. He was thereafter assigned to work at the Volkswagenwerk at Braunschweig, Germany. While employed at this plant, Quirin became acquainted with Heinrich Harm Heinck. In February 1942, Walter Kappe spoke to a meeting of persons living in Braunschweig who had previously resided in the United States. Heinck, thereafter, received a letter asking both him and Quirin to go on a trip to America to engage in some work for the German Government. This they agreed to and so advised Kappe. A short time later, they were instructed to proceed directly to Quentz Lake, Brandenberg, where they met Walter Kappe and other members of the group who went through the sabotage school with them. The files of the Federal Bureau of Investigation fail to indicate any prior criminal record for Richard Quirin. Werner Thiel was a member of the group of German saboteurs who were landed by submarine near Ponte Vedra Beach, Florida on the early morning of June 17, 1942. Thiel was subsequently taken into custody by Agents of the Federal Bureau of Investigation, tried before a military commission in Washington, D.C., and executed upon his conviction. Thiel was born on March 29, 1907, at Dortmund, Germany, where he was educated, receiving the equivalent of a high school education. Thiel was employed by German railroads as an apprentice machinist and as a machinist in a bicycle factory. Thiel arrived in the United States from Germany on April 26, 1927, on a German immigrant quota visa. On April 30, 1927, Thiel filed a declaration of intention to become a citizen but made no further effort in this regard. Thiel remained in the United States until 1941, being employed at various occupations, principally at his trade as a machinist in the state of New York and the Middle West. Thiel joined the Friends of New Germany in 1933 and continued as a member of this organization and the German-American Bund until 1936. He joined the NSDAP in 1939. Thiel returned to Germany on March 27, 1941, on a German passport, departing from San Francisco, California, on a Japanese liner proceeding to Germany via Japan, Manchuria, and Russia. The German Consulate in New York City financed Thiel's transportation to Germany on this trip. Upon arrival in Germany, Thiel first visited his home and then sought employment in Berlin where he obtained a position at the Feilers Feinmechanic. In March, 1942, Thiel attended a social gathering of the Ausland group at which time he met Walter Kappe whom he had known in Chicago, Illinois, and also George John Dasch who had returned to Germany in the same group as Thiel. Shortly thereafter, Thiel was recruited by both Kappe and Dasch to return to the United States on a mission for the German Government. The nature of the mission was not explained to Thiel until after he had arrived at the sabotage school at Brandenberg. The files of the Federal Bureau of Investigation fail to indicate any prior criminal record for Werner Thiel. Hermann Otto Neubauer was a member of the group of German saboteurs who were landed by a German submarine on the morning of June 17, 1942 near Ponte Vedra Beach, Florida. Neubauer was subsequently taken into custody by agents of the Federal Bureau of Investigation, tried before a military commission in Washington, D.C., and upon his conviction was executed. Neubauer was born in Fuhlsbuttl, Hamburg, Germany, on February 6, 1910. He attended public school in Germany and became an apprentice cook. Thereafter, while serving as a cook on the SS Hamburg of the Hamburg-American Lines, he jumped his ship in New York City in July 1931, at which time he obtained employment as a cook on the SS Leviathan of the United States Lines. Neubauer, thereafter, entered the United States for permanent residence under an immigrant quota visa on November 23, 1931. Neubauer then remained in the United States working at his occupation as a cook in various hotels and restaurants and occasionally obtaining employment on an oceangoing vessel. Neubauer made a short visit to Germany in 1936. He married a native American on June 10, 1940. Neubauer was a member of the German-American Bund in Chicago in 1935, but resigned because he was not a citizen of the United States. He thereafter became a member of the NSDAP in Chicago and remained a member of that organization until his return to Germany. In July 1938, Neubauer applied for and purchased one thousand dollars worth of Rueckwanderer marks. Neubauer was a friend of Edward Kerling and joined with him and several others in purchasing the yacht Lekala in September 1939 in order to return to Germany and assist country in its war effort. The US Coast Guard did not permit the departure of this vessel, and the vessel was subsequently sold in the spring of 1940 at Miami, Florida. While Neubauer was in the United States, he applied for his first citizenship papers but thereafter did not make further effort to obtain his final naturalization papers. Neubauer left New York on July 11, 1940 and returned to Germany via Lisbon, $50.00 of his passage having been paid by the German Consulate in New York City. The Germany Consulates in Lisbon and Rome paid his passage from Lisbon to Germany. Upon his return to Germany, Neubauer was drafted in the Germany Army in November 1940 and received military training at Magdburg, Germany, until May 1941, when his outfit was sent to Poland. Neubauer was seriously wounded by shrapnel three days after the declaration of war between Germany and Russia. He was hospitalized at Stuttgart, Germany, for six months. While convalescing at an Army Medical Center near Vienna, Austria, he received a letter from Lt. Walter Kappe of the German Army inquiring if he would be willing to go on a secret assignment to a foreign country where he had once lived. He agreed to accept such an assignment and during the latter part of March, 1942, he was called to his company office and furnished a railroad ticket to Berlin and an address, No. 6 Rankestrasse, where he was to report in civilian clothes. It was not until after he had proceeded to Lt. Kappe's office that he learned the nature of his mission to the United States and learned that his friend, Edward Kerling, was also to go on this mission. The files of the Federal Bureau of Investigation fail to indicate any prior criminal record for Hermann Otto Neubauer. Herbert Hans Haupt was a member of the group of German saboteurs who were landed by a German submarine on the morning of June 17, 1942, near Ponte Vedra Beach, Florida. Haupt was subsequently taken into custody by Agents of the Federal Bureau of Investigation, tried before a military commission in Washington, D.C., and upon his conviction was executed. Haupt was born on December 21, 1919, at Stettin, Germany. His father, Hans Max Haupt, was a soldier in the German Army during the First World War and came to the United States in 1923. Haupt entered the United States with his mother in March 1925. Herbert Haupt derived American citizenship during the naturalization of his father who became a citizen on January 7, 1930. Haupt was educated in the public schools of Chicago, Illinois, where his family had settled. He left high school during his third year in 1936 and obtained employment as an apprentice optician. Haupt was a member of the German-American Bund in Chicago. an alien. Haupt and his second friend, Wolfgang Wergin, after their arrival at Mexico City, went to the German Consulate where arrangements were made for Haupt and Wergin to return to Germany via Japan. The German Consulate furnished the expenses of this transportation and a German passport. The voyage to Japan was made in company with other Germans leaving Mexico. A short time after their arrival in Japan they went aboard a freighter, which, after evading the British blockade, arrived at Bordeaux, France. Haupt thereafter visited relatives in Germany. He was unable to obtain employment and was eventually recruited by Lt. Walter Kappe to return to the United States on a secret mission on behalf of the German Government. He was then sent to the sabotage school at Quentz Lake where he first learned the nature of the mission he was to engage in. Wolfgang Wergin also arrived in Germany with Haupt. He obtained employment in Germany and is believed to be in that country at the present time. The files of the Federal Bureau of Investigation fail to indicate any prior criminal record for Herbert Hans Haupt. Edward John Kerling was the leader of a group of German saboteurs who landed on the coast of Florida near Jacksonville from a German submarine on June 17, 1942. Kerling was born in Wiesbaden, Germany, on June 12, 1909. He entered the United States on March 5, 1929, under an immigrant quota visa and remained in the United States until 1940. He returned to Germany on two short visits in 1933 and 1936. He returned to Germany on two short visits in 1933 and 1936. During this period Kerling married his German- born wife and worked at various fields of employment, most of the time being spent working as a chauffeur and a domestic. Kerling was an active member of the German-American Bund and was also a member of the National Socialist Party, and he made no effort to become an American citizen. In September, 1939, after the outbreak of the war, Kerling, with a number of his friends who were active in the Bund, purchased the yacht Lekala aboard which they intended to return to Germany to assist Germany in the war. This yacht excited the suspicion of the US Coast Guard, and it was stopped on two occasions. The yacht was finally sailed to Miami, Florida, where it was disposed of in the spring of 1940. Kerling returned to Germany in June 1940, by way of Lisbon, Portugal. The German Government paid a portion of his fare to Germany. In August 1940, he obtained a position as a civilian employee of the German Army to monitor English radio broadcasts and translate the programs into German. After three months at this work, he obtained a position with the Propaganda Ministry in Berlin. In April 1942, Kerling was interviewed by Lt. Walter Kappe who inquired as to his experiences in the United States and whether he would be willing to return to the United States on a secret mission. Kerling agreed to return to the United States, although he was not informed of the nature of this mission until just before he entered sabotage school at Quentz Lake. The files of the Federal Bureau of Investigation fail to indicate any prior criminal record for Edward John Kerling. 1. The intention of this paper is to formulate an overall deception policy for the war against Germany in accordance with CCS 426/1 of 6 December 1943, paragraph 9(e). 2. To induce the enemy to make faulty strategic dispositions in relation to operations by the United Nations against Germany agreed upon at EUREKA. 3. The German General Staff will this winter be considering the strategic disposition of their forces to meet offensive operations by the United Nations in 1944. Though they will be forced to maintain the bulk of their forces on the Russian front, they already suspect that large-scale Anglo-American operations will be undertaken in Western Europe sometime in 1944. It is, however, doubtful whether they have at present sufficient information regarding the timing and scope of this threat to justify any immediate changes in their strategic dispositions. 4. At a later stage, however, preparations for "OVERLORD" and to a lesser degree for "ANVIL" will be on such a scale and of such a type that the enemy cannot fail to appreciate our intention to carry out a cross-channel operation and an amphibious operation in the Western Mediterranean. We must persuade the enemy to dispose his forces in areas where they can cause the least interference with operations "OVERLORD" and "ANVIL" and with operations on the Russian Front. As soon as our preparations for "OVERLORD" and "ANVIL" clearly indicate to the enemy our intention to undertake a cross-channel operation and an amphibious operation in the Western Mediterranean, Theatre Commanders concerned must implement their tactical cover plans to deceive the enemy as to the strength, objective and timing of "OVERLORD" and "AVIL." It should be possible by means of real operations and feints to contain a number of first quality divisions in this area. "POINTBLANK" operations from Italy should also help to contain enemy fighter forces. The JIC appreciate that the enemy will do his utmost to hold South East Europe, though limited withdrawals from the islands and Southern Greece might be undertaken. Provided that we can persuade the enemy to believe that considerable forces and landing craft are being concentrated in the Eastern Mediterranean it should be possible to contain enemy forces in the Balkans. Our chances of success would be increased if Turkey joined the Allies, but even if she refused we might still induce the enemy to fear the results of our continued infiltration. The deception plan would be assisted to a marked degree if the Russian General Staff staged an amphibious threat to the Bulgarian-Roumanian coasts across the Black Sea. A threatened attack against Scandinavia should also help to contain some first-quality divisions and limited naval air forces. Such a deception plan would be assisted if the Germans were induced to believe that Sweden was prepared to co-operate with the Allies and if the Russians mounted a threat against enemy occupied territory in the Arctic. Allied Preparation for "OVERLORD" and "ANVIL"
It will be impossible wholly to conceal the gradual build up of Allied forces and other preparations in the United Kingdom during the next few months. In addition the enemy will appreciate that considerable American forces in the USA are available for transfer to Europe. In these circumstances our best chance of deceiving the enemy would be to indicate that Anglo-American strategy is dictated by caution and that we have no intention of undertaking the invasion of the Continent until we had assembled an overwhelming force and the necessary landing craft; these would not be available until the late Summer. To support this story we must try to indicate that the assault and follow-up forces at present available in the United Kingdom are less than they in fact are, and that during the next few months we could only re-enter the Continent against little or no opposition. Preparations and the build up for "ANVIL" should no be so apparent in the early stages, therefore the tactical cover plan eventually put into operation by Allied Commander-in-Chief, Mediterranean Theatre, should suffice to cover this assault. In the Mediterranean theatre the enemy has in the past been induced to overestimate Allied forces by 20 to 30 per cent. It would be an advantage if such exaggeration could be maintained especially in the Eastern Mediterranean. 8. The Russian offensive will presumably be continued during the next few months but it would be of assistance to our plans if we could lead the enemy to believe that the Russian main Summer offensive would not start before the end of June. It would be plausible that this operations should thus precede "OVERLORD" and "ANVIL" thereby rendering the maximum assistance to these far more hazardous seaborne assaults. 9. a. Preparations for "OVERLORD" during the next few months and any announcements of the appointment of prominent commanders in the United Kingdom will indicate to the enemy that our main strategy is switching from the Mediterranean to North Western Europe. b. Statements both in the press and on the radio and the platform may continue to emphasize the likelihood of operations in 1944 from the United Kingdom against North Western Europe. c. "POINTBLANK" operations from the United Kingdom will compel the enemy to keep strong GAF fighter forces in North Western Europe. 10. a. Germany's armed forces are dangerously stretched by current operations and provided we can induce her to retain surplus forces in Scandinavia, Italy and the Balkans, she will find it difficult simultaneously to provide adequate forces for Russia, France and the Low Countries. i. The political and economic situation in Germany and occupied countries is deteriorating and may necessitate the maintenance of strong garrison forces in these areas. ii. The attitude of neutrals and satellites may move further in favour of the Allies and compel Germany to dispose reserves to meet unfavour-able developments. c. The assembly of the Rosyth force in NE Scotland will reinforce the threat to Scandinavia. 11. The following Overall Deception Policy is based upon the considerations outlined above. We should induce the enemy to believe that the following is the Allied plan for 1944.
a. "POINTBLANK" operations were seriously affecting the enemy's war potential and, if continued and increased, might well bring about his total collapse. Consequently, reinforcement of the United Kingdom and the Mediterranean by long-range American bombers has been given such a high priority that the ground forces build-up in the United Kingdom has been delayed. b. The Allies must be prepared to take advantage of any serious German weakening or withdrawal in Western Europe and preparations to this end must be put in hand forthwith. c. To concert in Spring an attack on Northern Norway with Russia with the immediate object of opening up a supply route to Sweden. Thereafter to enlist the active co-operation of Sweden for the establishment of air bases in Southern Sweden to supplement "POINTBLANK" with fighter bomber operations and to cover an amphibious assault on Denmark from the United Kingdom in the summer. i. An Anglo-American assault against the Dalmatian coast. ii. A British assault against Greece. iii. A Russian amphibious operations against the Bulgarian-Roumanian coast. iv. In addition Turkey will be invited to join the Allies to provide operation facilities including aerodromes to cover operations against the Aegean Islands as a prerequisite to the invasion of Greece. Her refusal would not materially modify the Allied intentions. v. Pressure against the satellites to induce them to abandon Germany. e. Anglo-American operations in Italy would be continued, and in order to hasten their progress, amphibious operations against the north-west and north-east coast of Italy would be carried out. Provided these were successful, 15 Army Group would later advance eastward through Istria in support of the operations mentioned in d. above. Note: The operations in c. d. and e. above would enable us to employ our amphibious forces and retain the initiative until preparations for the final assault in the late summer were completed. f. Though Russian operations would presumably be continued this winter it would not be possible for them to launch their summer offensive before the end of June. g. In view of the formidable character of German coastal defenses and the present enemy strength in France and the Low Countries, possibly as many as twelve Anglo-American Divisions afloat in the initial assault and a total force of about fifty divisions would be required for a cross-channel assault. This operation would not be launched until the late summer (i.e. after the opening of the Russian summer offensive). i. Shortage of manpower has obliged the British Army in the United Kingdom to resort to cannibalization, while several of their formations are on a lower establishment, or still lack their administrative and supply units. The number of Anglo-American Divisions in the United Kingdom available for offensive operations is less that is, in fact, the case. Some United States Divisions arriving in the United Kingdom have not yet completed their training. ii. Personnel of certain Anglo-American Divisions in the Mediterranean with long service overseas are being relieved by fresh divisions from the USA. British troops will, on relief, return to the United Kingdom where they will re-form and be utilized for training inexperienced formations. iii. Invasion craft remains the principal bottleneck due to operations in the Pacific and the full number required for the initial assault cannot be made available from home production and the USA before summer. i. Anglo-American forces in the Mediterranean, especially in the Eastern Mediterranean, are greater than is, in fact, the case. ii. French forces are taking over responsibility for the defense of North Africa, thus leaving Anglo-American forces free for offensive operations elsewhere in the Spring of 1944.
iii. Certain British Divisions and landing craft are being transferred from India to the Middle East. iv. Fresh Divisions from the United States of America are expected to arrive in the Mediterranean. When the enemy realizes that cross-channel operations are imminent, the story indicating that no cross-channel attack will occur until late summer, will tend to lose plausibility. At this juncture the tactical cover plan prepared by Supreme Commander, Allied Expeditionary Force will come into force with a view to deceiving the enemy as to the timing, direction and weight of "OVERLORD." In due course the enemy will probably appreciate, especially from air reconnaissance, that an amphibious operation is being mounted in North African ports and Western Mediterranean Islands. At this stage, a tactical cover plan prepared by Allied Commander-in-Chief, Mediterranean Theatre will come into force with a view to deceiving the enemy as regards the timing, direction and weight of "Anvil." 15. The selection of a D day of all cover and deception plans mentioned above is a question to be decided by Supreme Commander, Allied Expeditionary Force. In this connection, it is recommended that the dates chosen should, in each case, be later than "OVERLORD" or "ANVIL D days, with a view to delaying the dispatch of enemy reinforcements for as long as possible. The Supreme Commander, Allied Expeditionary Force after consultations with Commander-in-Chief, Mediterranean Theatre and the Controlling Officer will decide the tempo of the "OVERLORD" and "ANVIL" tactical cover plans. Implementation by means of movements of forces, camouflage devices, W/T deception and other activities will be carried out in accordance with detailed plans prepared by Supreme Commander, Allied Expeditionary Force and Allied Commander-in-Chief, Mediterranean Threatre. Genuine diplomatic approaches will be required to lead the enemy to believe that we intend persuading Sweden to join the Allies and assist us in operations in Scandinavia. Even if Turkey refuses to join the Allies in the near future, the enemy should be led to believe that our continued infiltration may give the Allies important opportunities in connection with a Balkan campaign. Implementation by means of leakage and rumors in support of plans prepared by Theatre Commanders will be co-ordinated by the London Controlling Section. The Political Warfare plan while not departing from its main purpose, should conform to the above general policy. Plan "BODYGUARD" cannot succeed unless the strictest security precautions are taken to conceal the true name of "OVERLORD" and "ANVIL" preparations. To support "Plan Bodyguard" the British used a double-agent operation, codenamed GARBO. GARBO was Juan Pujol Garcia who convinced German intelligence that he could provide them with information on the United Kingdom. He told the Abwehr that he was on his way to London to check on a currency racket there for the Spanish security services. German intelligence bought his story and recruited him. They gave Pujol secret ink to communicate with them via an accommodation address in Madrid. In reality, Pujol did not go to London but traveled as far as Lisbon where he began to send his reports to the Germans. He had no access to any information but created much of his information from his incredible imagination and old maps and timetables from England. For ten months, between July 1941 and April 1942, he authored 40 long reports for German intelligence. Pujol had offered his services to British intelligence in Madrid in January 1941 but was turned aside. It was not until Bletchley Park began deciphering the Enigma messages between Abwehr Headquarters in Berlin and its station in Madrid in 1942 that British intelligence decided to locate a "new German spy" in the United Kingdom that was providing outlandish British military information to the Germans. An investigation determined that this German agent was not operating in Great Britain but British intelligence could not provide any additional information as to his identity or location. Through a fortunate set of circumstances, the British were able to learned of Pujol's existence. MI5 learned about Pujol from its Lisbon representative who was visiting London at the time. MI5 informed MI6 about Pujol. MI6 was able to arrange contact with Pujol through the US Naval Attaché in Lisbon. After contact was made, MI6 recruited Pujol and brought him to London in April 1942. He was given the codename GARBO. This is the story of GARBO and his network of agents, which helped set the stage for the success of the Normandy Invasion on D-day. On 24 April 1942, GARBO reached England from Spain and began work for British intelligence under the guidance of his case officer, who was bilingual in Spanish and English, and in peacetime specialized in the collection and sale of works of art. It was to prove one of those rare partnerships between two exceptional gifted men whose inventive genius inspired and complemented one another. GARBO was a man of phenomenal industry. For the first year of his stay in England he communicated with his control in Madrid entirely by letter; messages in secret ink with covering letters written over them, notionally carried to Portugal by the employee of an airline running a regular service between London and Lisbon (the COURIER), who posted them to Abwehr accommodation addresses in Lisbon and collected the replies from a safe deposit box in a Lisbon bank. In fact, delivery and collection was arranged by MI6. GARBO wrote altogether 315 such letters, their length averaging 2,000 words, as well as the equally garrulous covering letters that concealed them. After March 1943 he was able to supplement these by radio messages, notionally transmitted by a radio "ham" of leftwing sympathies who had built his own set and who believed that the ciphered messages he transmitted were the communications of a group of leftwing Spanish exiles with their comrades at home. A total of 1,200 messages were passed over this channel before the end of the war. GARBO began to operate before there was a coherent deception policy for him to implement; so, for lack of anything better to do, as his case officer put it, "we tried to report in as much confusing bulk as possible and, in the absence of another objective, to increase our network of notional agents." The "confusing bulk" was highly effective in that the Madrid Stelle of the Abwehr became so glutted with information that it made no further attempt to infiltrate agents into the United Kingdom. It became entirely dependent on GARBO, regarding him as a sensitive quarrelsome genius of priceless value who had at all cost to be humored and satisfied. By the end, GARBO and his British case officer were able to treat his German case officer as a temperamental mistress might treat an elderly and besotted lover, no assertion that GARBO made would be questioned, no demand went unmet. By 1944, GARBO and his British case officer had between them built up a notional network of some 27 agents. In the first place there were five immediate contacts, labeled J1 to J5. J1 was the courier who carried the letters to Lisbon. He was himself involved in a smuggling racket and believed that GARBO was also. J2 was a Royal Air Force (RAF) officer employed at Fighter Command Headquarters, a casual acquaintance who unwittingly occasionally let slip important information. J3 was a most useful friend, an official in the Spanish section of the Ministry of Information, where he occasionally saw interesting policy documents. J4 was another official he met at the Ministry, a man of extreme leftwing views who worked in the censorship department. J5 was a girl secretary in the "Ministry of War" (sic) who was a little in love with GARBO and who could be relied upon for the occasional silly indiscretion. Then there were the agents themselves. The first two had been notionally recruited even before GARBO actually arrived in England, while he was writing his hilariously inaccurate letters from Lisbon. Agent 1 was a Portuguese commercial traveler named Carvalho, based at Newport, Monmouthshire; well placed to observe traffic in the Bristol Channel and, as it turned out, to make contact with dissident Nationalist elements in south Wales. Agent 2 was a German-Swiss businessman named Gerbers, domiciled in Bootle, who reported on traffic in the Mersey. Tragically, it became necessary for Gerbers to die of cancer during the autumn of 1942 before he could observe the assembly, in the Mersey estuary, of the convoys for TORCH (the invasion of North Africa by the allied forces). But, his unfortunate widow proved willing to carry on the activities of her deceased husband. She was recruited as Agent 2(1) (though usually referred to simply as "the Widow") and became virtually GARBO's personal assistant. Agent 3 was a Venezuelan based in Glasgow, who observed traffic on the Clyde. A man of enthusiasm and efficiency, he became second in command of the network and took it over after GARBO had been notionally "blown" in 1944. He had three subagents of his own; an NCO in the RAF (3(1)); a talkative lieutenant in the notional 49th Infantry Division (3(2)); and a useful Greek sailor who operated on the east coast of Scotland (3(3)). The first two were unconscious agents, the last a Communist who believed that he was working for the Soviet Union. This network received from the Germans the codename BENEDICT. Agent 4 was a Gibraltese, "Fred," who originally worked as a waiter in Soho, where he put GARBO in touch with the radio operator already referred to. He was then directed by the Ministry of Labour, first to employment in a subterranean munitions deport in the Chislehurst caves, about which GARBO and his British case officer wove a rich fantasy for the benefit of the Abwehr; then to work in military canteens, where he picked up much useful information; and finally to one of the sealed military camps in the region of Southampton where he was able to observe the final concentrations for OVERLORD. Strict security precautions prevented him from leaving his camp to report on these in detail until he broke out, as will be recalled, on the very eve of the operation with the news which GARBO transmitted to his control in Madrid; just too late to be of any value. In addition to the Radio Operator (Agent 4(1)), "Fred" recruited a guard in the Chislehurst caves (4(2)) and, much more usefully, an American sergeant who worked in London for the US Service of Supply (4(3)). This man was a particularly valuable source. Not only was he well informed about the movements and constitution of the 1st US Army Group, but he was the son of a senior American officer on Eisenhower's staff who was ferociously anti-British and passed on to his son all the gossip about high-level disagreements that came his way. The Patton deception owed much to the information he so indiscreetly communicated. Agent 5 was the brother of the Venezuelan, Agent 3, and was eventually dispatched to Canada to observe matters there. He had a colleague, an American commercial traveler (5(1)) who filled in with information about the United States. Agent 6 was an anti-British South African whose linguistic skills gained him employment with the War Office. He was posted to North Africa, where he collected much high-level and accurate information but since he could transmit it only by letter to GARBO, who then had to forward it to Lisbon, by the time it reached the Germans it was very out of date. He died, unfortunately, in an air crash in July 1943. By the summer of 1943, the existence of these networks was well established, and COCKADE (Diversionary operations in 1943 to pin down German Forces in the West) gave GARBO and his British case officer valuable practice in using them. A procedure was established by the London Controlling Section, which was to become the regular pattern by the time of OVERLORD. The cover story was broken down into a number of serials. Each serial contained a story to be passed to the enemy, the date by which it had to be in his possession, and the factual evidence for it. The evidence was then compared and collated with the observing capacity of the GARBO network, and appropriate messages were devised for the agents which, after clearance with the Service authorities (at first through the Twenty Committee but increasingly direct) were then passed on to Madrid in GARBO's inimitably florid style. From Madrid, as SIGINT revealed, these were sent directly to Berlin, where they made an excellent impression. After STARKEY (a notional attack by 14 British and Canadian divisions to establish a bridgehead on either side of Boulogne between 8 and 14 September) had passed its climax on 8 September 1943, his Abwehr case officer wrote enthusiastically to GARBO on 18 September: "Your activity and that of your informants gave us a perfect idea of what is taking place over there; these reports, as you can imagine, have an incalculable value and for this reason I beg of you to proceed with the greatest care so as not to endanger in these momentous times either yourself or your organization." Four months later, in early January, his Abwehr case officer warned GARBO once more to prepare for action. German intelligence, he informed him on 5 January 1944, had learned that preparations were far advanced for a major operation based on the United States, which might materialize at a very early date. GARBO was therefore to find out everything he could about Allied military intentions, the dates of forthcoming operations, and the locations and strength of all land, sea, air, and amphibious forces that might be employed. This, he was told, included possible operations against Norway and Denmark, as well as those against the Channel coast. To tackle this new assignment, GARBO redeployed his agents. Fortitude North was covered basically by the Venezuelan (3) in Glasgow and by the Greek sailor (3(3)) on the Scottish east coast. "Fred" from Gibraltar had, as we have seen, insulated himself into the heart of the Allied concentration around Southampton, while the DAGOBERT network covered the rest of the south coast, with agents in Harwich, Dover, Brighton, and the west country and south Wales. GARBO's informants in Whitehall had only to keep their eyes and ears open, and he himself picked up a lot of useful news and one or two documents in his capacity as part-time employee in the Ministry of Information. The agents sent their messages to him in secret ink, but GARBO now communicated with Madrid very largely by radio, sending an average of five or six messages a day. The information in GARBO's reports now found its way into the daily situation reports of Fremde Heere West (Army High Command Foreign Armies West); in particular, the Order of Battle projected by him and by BRUTUS (a Polish Air Force officer recruited by the Germans and sent to England via the French resistance in 1942, but who turned himself over to the British and was doubled back at the Germans-now established at First United States Army Croup (FUSAG) HQS was accepted without question. All was carefully coordinated directly with Ops B at Supreme Headquarters Allied Expeditionary Force (SHAEF), and a great deal of accurate information was included about the 21st Army Group. When the formations specified by GARBO as belonging to this Army Group were identified in Normandy, it made his further information about FUSAG all the more credible. As part of the deception plan, GARBO was given permission to warn the Germans of the attack at Normandy. He did so at 3:00 A.M. on 6 June. The message to his controller in Madrid was timed to arrive too late to be of any value to the Germans. GARBO waited for a response, which never came. He again sent a second message at 6:08 A.M. Again in the evening he sent a third message, this time bitterly complaining of the German failure to respond to him. After his fourth message the next day, his controller finally responded, adding that the work GARBO did over the "past few weeks has made it possible for our command to be completely forewarned and prepared, and the message of Four would have influenced but little had it arrived three or four hours earlier." Undeterred by this setback, GARBO summoned a meeting of all available agents, as a result of which he transmitted a long report, on the night of 8 June about the existing Allied dispositions. I learned yesterday that here were 75 divisions in this country before the present assault commenced. Suppose they would use a maximum of 20-25 divisions they would be left with some 50 divisions with which to attempt a second blow." All this his Abwehr case officer acknowledged gratefully on 10 June. "With reference to your extensive information of the 8th on the concentrations still existing in the southeast of the Island, I am interested in the transmission with the maximum urgency of as much news as you can obtain of the embarkation and destination of these forces." At the same time Bletchley Park decrypted the congratulatory messages to GARBO's German case officer from Berlin. "In the name of Fremde Heere West, stated one on 9 June, "I express appreciation of previous work in the last week from CATO (GARBO's German codename) have been confirmed almost without exception and are to be described as especially valuable." By the end of August, MI5 had begun to fear that GARBO's cover could not be preserved for very much longer. The growing number of Abwehr defectors in neutral countries must, MI5 thought, lead the Germans to assume that the Allies would by now have been informed of the existence of this network operating so effectively in their midst, and it would look very odd if it continued to operate undisturbed. In the middle of August, a Spanish informant did in fact tell MI6 about GARBO, and this was taken as the excuse for sending GARBO into notional retirement. GARBO informed his Abwehr case officer on 12 September that he had been warned of his betrayal by friends in Spain and was going to ground. The network would henceforth be operated by his Venezuelan Lieutenant GARBO himself would still mastermind operations from a cottage in Wales, but the British would be led to believe, by a forlorn and distraught Mrs. GARBO, that he had returned to Spain. It was a neat solution. GARBO's deputy could not be blown, since his name had never been revealed to the Germans. An even more important guarantee of his security was that he did not exist. Communications ceased to be written in GARBO's inimitably baroque style, but they still continued, now, conducted directly by MI5. For the last six months of the war, therefore, the British security services were in direct radio communication with German intelligence, keeping it supplied with a stream of misinformation to which the latter attached the highest degree of credibility. The Abwehr paid good money for their informa-tion. GARBO's notional expenses, partly to an address in Lisbon where the money was notionally collected by "the Courier," in fact picked up by MI6, and partly by a transfer of funds effected through a nominee of GARBO in Spain who held a sterling balance in London.